Hmmm....let's see...what's hiding in the freezer? A-ha! Crab! Why not, I thought. 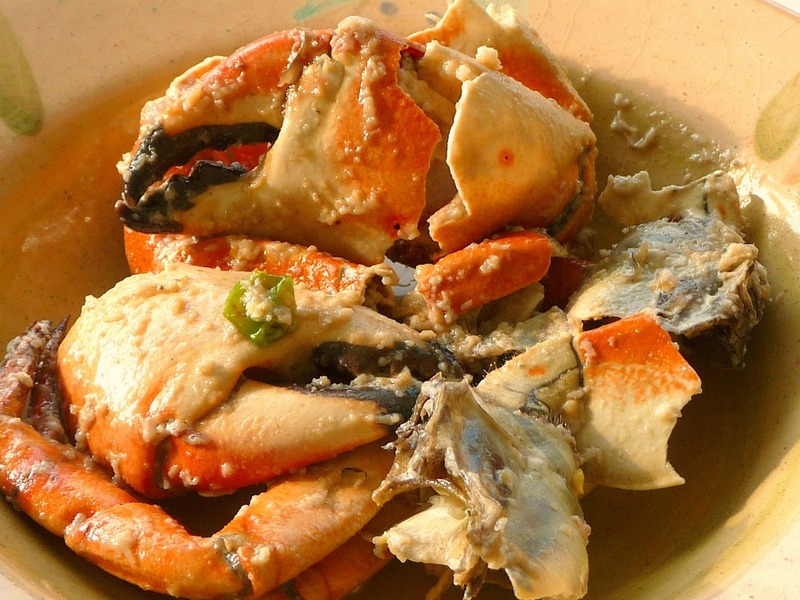 Growing up in the Philippines we have these tiny crabs we call "talangka." Each crab was about the size of a silver dollar, and my mom always made it with chili and coconut milk. "Talangka" actually has little meat in it, if any at all, but what is prized about it is the red juicy fat we call "aligi." It is so flavorful, in fact it is sinful (no really, it's high in cholesterol, that's why it's so good). "Aligi" and coconut milk is just like hand in glove, coffee and cream, Sonny and Cher....you get the picture. 1. Boil enough water in a deep pot to submerge the crab. When the water boils, carefully place the crab in the pot. Cover the pot and cook for about 5 to 7 minutes. Remove the crab from the water and let cool. 2. Remove the top shell of the crab and discard. Remove and discard the gills of the crab. Cut up the crab into quarters, and crack the claws and legs. 3. In a skillet, heat up the oil, and cook the garlic until golden brown. Add the chili and crab. Stir well until the crab are coated with the garlic and oil. Add the coconut milk and stir until the crab is well coated. Cover the pan and simmer for about 5 minutes. If the sauce is too thick, you can thin it with a few tablespoons of the crab water. Season with salt to taste. Best served with rice.